While you’re counting your newborn’s fingers and toes, your medical team has some counting of their own to do. In the first two days or so of your baby’s life, doctors will perform tests that screen for up to 30 or more conditions! Here’s what to expect, starting the moment your baby arrives. A score of 7-9 is normal. (Most babies don’t get a 10 because it’s so common to be born with blue-tinted hands and feet.) A score of 6 or below often means your newborn needs a little help to get stable. Doctors repeat the test at the 5-minute mark. If your baby’s score is still low, doctors will test again in another 5 minutes to make sure your baby’s heart and respiration are doing OK.
A tiny prick to your baby’s heel, and a few droplets of blood, can tell doctors a ton about your newborn’s health. The blood test lets doctors screen for more than 20 disorders, including sickle cell anemia, hypothyroidism, and maple syrup urine disease. Exactly which conditions the blood test screens for depends on your state and hospital. Many states require that doctors test for all 29 disorders the American College of Medical Genetics recommends screening. Others only require the minimum 21 conditions, although your hospital may choose to screen for more. More screening may or may not be better for your baby. Your medical team weighs factors like expense, your baby’s risk of having a particular condition, and available treatment options to decide whether a test makes sense for your family. Your option to decline this testing also depends on your state. 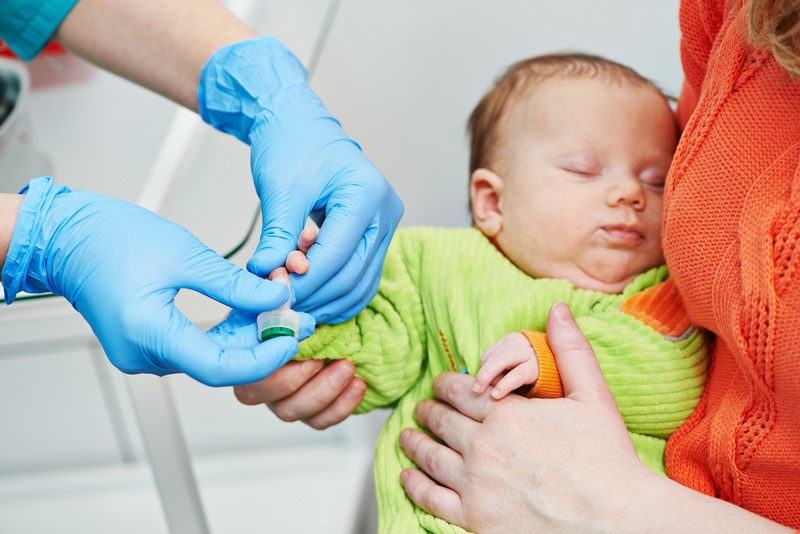 A few states require your consent to perform the blood test on your newborn. Others require you to have paperwork prepared documenting your decision to decline the test. Newborn test screens are done to identify potentially life-threatening conditions as quickly as possible, so talk through your options carefully with your doctor before making a choice to decline the blood test. Unlike the blood test, the baby’s hearing test doesn’t require a shot. In most cases, your baby will be asleep. A doctor or nurse will place a small, soft microphone probe in your baby’s ear and measure echoes within the baby’s ear in response to noises from the probe. Because the sounds can be faint, it’s usually best if your baby is asleep, so that he’s quiet enough for the instrument to pick up faint sounds. An alternate version of the hearing test is an Auditory Brainstem Response (ABR) test. The doctor places tiny earphones in your baby’s ears, and measures brain response via electrode stickers placed on the baby’s scalp. This test, also known as a congenital heart disease screening, could save your baby’s life. Pulse oximetry tests for congenital heart conditions that affect about 1 in 100 babies, and which can cause disability or death if left untreated. Catching the condition early can alert doctors to start treatment that can significantly reduce or eliminate the risks to your baby. The icing on the cake is that this is another painless test. A sensor on your baby’s skin measures blood oxygen levels. The test only takes a few minutes to signal whether your baby’s blood oxygen is where it should be. No one likes to see their brand new baby in pain. But a few moments of discomfort can catch a host of serious diseases early. For the best pain relief, just look down: Snuggling in your arms, and breastfeeding if you’re able, will soothe your baby in moments.